Some productive trips at the Cap this week! Can’t beat fishing close to home. 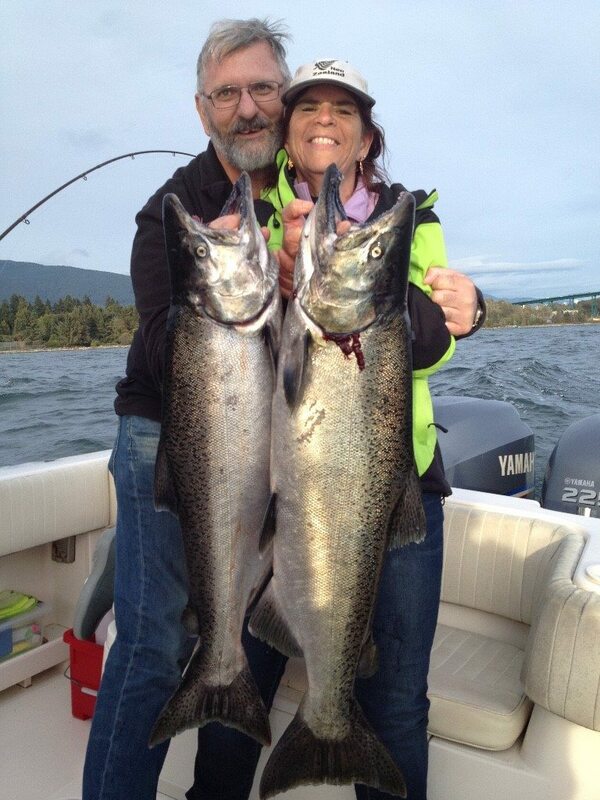 It’s that time of year where we look forward to some of the bigger white chinook showing up in our local waters and so far so good. We have had some good catches this past week off the Cap, as the low-pressure system mid week seemed to concentrate the fish off the river mouth. IMPORTANT NOTICE: The Port of Vancouver is paying close attention to the boat traffic off the Cap Mouth and is currently in meetings with and taking input from different sectors. We don’t want this fishery to close. I will be in some meetings over the next few weeks to represent all of our rights to access our local waters and this fishery. You can help by being aware of your surroundings. Keep an eye out for freighters and cruise ships leaving and approaching First Narrows. Get out of the way well, well in advance and move up the shoreline, west, towards Ambleside Beach. I have been told it is not so much boats fishing off the Cap Mouth they are concerned about, more so the reaction time of anglers fishing in this area when freighters and cruise ships are approaching. They want us to move a lot sooner than we generally are. Don’t wait until they are right at the bridge and sounding a horn before you move west. It should go without saying to stay close to the shoreline, and also, don’t fish past the green marker. This is an amazing fishery that we all get to participate in with thousands of coho and chinook salmon returning to our doorstep every year. 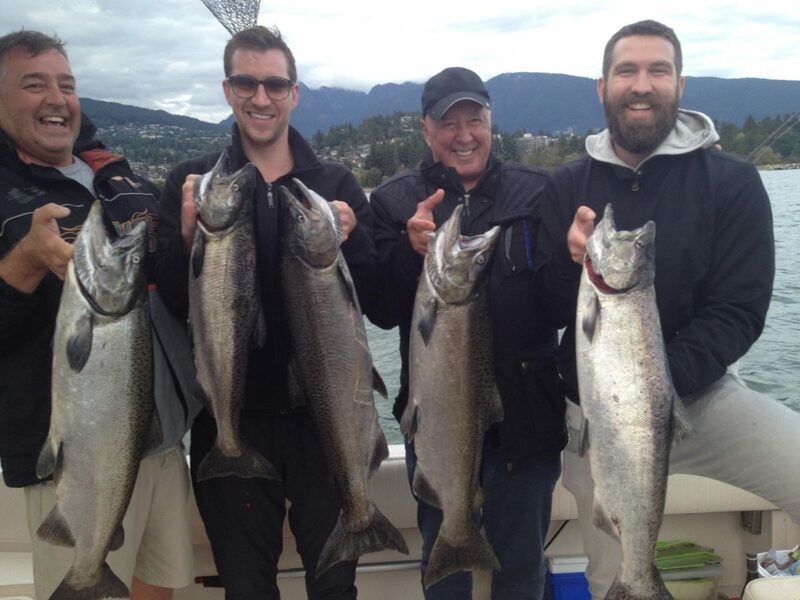 If you would like to let the Port of Vancouver know how special this fishery is, you can do so by email. Please take the time to do this, it is very important they hear from you and they are now accepting input via this email address. Okay, back to fishing. It has been good down at the South Arm as well. A little spotty on some days, but this is normal as the chinook this time of year roll in one tide change go up the river the next. The orcas have been down there a few times a week as well, so that can make it a bit hit and miss. There are still lots of chinook on the way as I was in Sooke on Monday and they were catching some white chinook in those waters that are headed to the Fraser. Captain Tom + guest with an evening catch at the Cap. Bait is always the best this time of year and productive depths have been 35-75 on the riggers at South Arm and just off the bottom at the Cap. We have covered productive flashers and teaser heads in depth on many reports, but if you don’t have a Green Onion Glow, Salty Dawg, Madi, or Chartreuse Glow in you tackle box, you should. Rhys Davis glow green and glow chartreuse teaser heads are the go to this time of year for your anchovies and herring.